Labour expresses 'profound concerns about the robustness of the referendum process' after vote split. Claims of insecure voting and "electoral fraud" in Aberdeen's city gardens ballot has prompted calls for statutory guidelines on the conduct of local referenda. 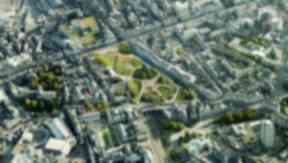 On Friday the people of Aberdeen voted in a referendum on whether to retain Union Terrace Gardens as they are or approve a radical £140m redevelopment. There were 45,301 votes for the project, compared with 41,175 to retain the gardens. Labour local government spokeswoman Sarah Boyack said last week's referendum on the redevelopment of the city's Union Terrace Gardens has "national implications" due to its "absence of fair campaign spending rules" and the voting methods used. The SNP accused her of bringing an inappropriate "sour grapes motion" to Holyrood because the 52% Yes vote did not reflect Labour's opposition to the plan, at a meeting on Thursday. However, Ms Boyack said the Aberdeen referendum must be considered "in the context of the biggest vote that the people of Scotland are due to make" on independence. She said: "We need to make sure that the rules on referenda are fair, transparent and consistent, so it goes to the heart of this Parliament. "This referendum was held without agreement of all the parties in the council, and there were no effective controls over spending in the campaign, and we have profound concerns about the manner in which the proposals were communicated and the conduct of the referendum." Ms Boyack said there is "no statutory framework for a local referendum". She continued: "I believe that there are sufficient concerns about the robustness of the process conducted in Aberdeen that some thought should now be given by all parties as to how agreement can be reached on local referenda to establish clear principles that should be followed in all cases." "Online and telephone voting were permitted, and those produced a different outcome from the postal ballot. They were not secure, and anyone opening an envelope containing the voter's ballot paper could obtain the unique identifying number which was all that was need to record a vote. "In a city with hundreds of tenement blocks, and thousands of students in residences, the potential for electoral fraud was clear and police were called in to investigate on more than one occasion, although apparently without anyone charged so far." During the Holyrood debate, SNP MSP Mark McDonald asked if Ms Boyack had "any evidence whatsoever that the vote was not secure or solid", as opposed to "idle speculation and scaremongering". Ms Boyack said: "All I need to report to you is that complaints have been made. That surely is enough, and that's why we need an investigation." Infrastructure Secretary Alex Neil said Ms Boyack's motion was "one to be moved in the Aberdeen Council chambers rather than the Scottish Parliament". SNP, Tory and Lib Dem north-east MSPs lined up to criticise Labour in parliament. Conservative Nanette Milne branded the party "despicable" for its approach, warning it against overturning the referendum result if elected to run the city council in May. She said: "I'm sorry to say that Labour's motion today appears to have little to do with the future of Aberdeen and everything to do with the future - if there is one - for Labour on Aberdeen City Council. "Their attempt to win council election votes from those who voted against the city garden project is despicable and could well backfire on them." Labour, she said, has "behaved like spoilt brats" since losing the council, and now is unable to come to terms with opposition. SNP MSP Maureen Watt said the controversial garden plan may help encourage long-term investment. She added: "Given that the local Labour Party tried to make it a party political issue, and I've no doubt are basing their local election campaign on it, they are now in panic mode. "Holding a referendum was the right thing to do. Friends of Union Terrace Gardens supported a referendum. They supported the question asked. "Now we see the Labour Party questioning the whole validity of the referendum." Labour MSP Lewis Macdonald confirmed his party would not back the gardens plan if elected to run the city. He said: "This was the third time public opinion was canvassed, but the first time this project had achieved any kind of majority. "Far from showing strong support, it confirmed what we knew from the previous consultation and from every opinion poll carried out by the local press: that public opinion is divided in the city. "Therefore, the buck stops with those elected to take decisions in the council."